The atmosphere is an envelope of air that surrounds the Earth and rests upon its surface. It is as much a part of the Earth as is land and water. However, air differs from land and water in that it is a mixture of gases. It has mass, weight, and indefinite shape. Air, like any other fluid, is able to flow and change its shape when subjected to even minute pressures because of the lack of strong molecular cohesion. For example, gas will completely fill any container into which it is placed, expanding or contracting to adjust its shape to the limits of the container. The atmosphere is composed of 78 percent nitrogen, 21 percent oxygen, and 1 percent other gases, such as argon or helium. Most of the oxygen is contained below 35,000 feet altitude. Though there are various kinds of pressure, pilots are mainly concerned with atmospheric pressure. It is one of the basic factors in weather changes, helps to lift the aircraft, and actuates some of the most important flight instruments in the aircraft. These instruments often include the altimeter, the airspeed indicator (ASI), the vertical speed indicator (VSI), and the manifold pressure gauge. Figure 11-1. Standard sea level pressure. A standard temperature lapse rate is one in which the temperature decreases at the rate of approximately 3.5 °F or 2 °C per thousand feet up to 36,000 feet. Above this point, the temperature is considered constant up to 80,000 feet. A standard pressure lapse rate is one in which pressure decreases at a rate of approximately 1 “Hg per 1,000 feet of altitude gain to 10,000 feet. 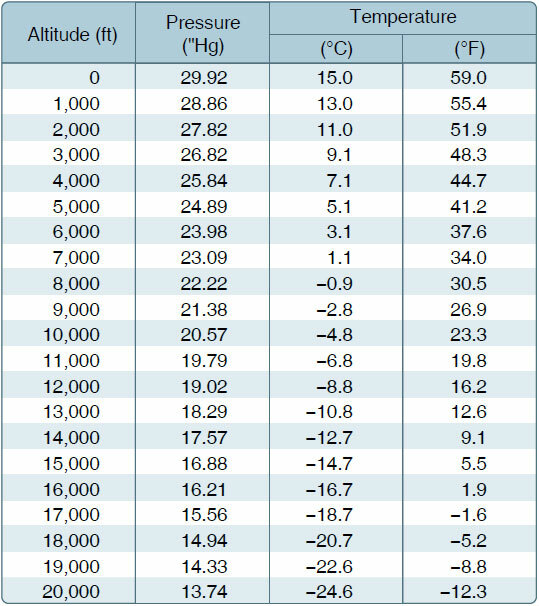 [Figure 11-2] The International Civil Aviation Organization (ICAO) has established this as a worldwide standard, and it is often referred to as International Standard Atmosphere (ISA) or ICAO Standard Atmosphere. Any temperature or pressure that differs from the standard lapse rates is considered nonstandard temperature and pressure. Adjustments for nonstandard temperatures and pressures are provided on the manufacturer’s performance charts. Figure 11-2. Properties of standard atmosphere. Since all aircraft performance is compared and evaluated using the standard atmosphere, all aircraft instruments are calibrated for the standard atmosphere. Thus, certain corrections must apply to the instrumentation, as well as the aircraft performance, if the actual operating conditions do not fit the standard atmosphere. In order to account properly for the nonstandard atmosphere, certain related terms must be defined. Pressure altitude is the height above the standard datum plane (SDP). The aircraft altimeter is essentially a sensitive barometer calibrated to indicate altitude in the standard atmosphere. If the altimeter is set for 29.92 “Hg SDP, the altitude indicated is the pressure altitude—the altitude in the standard atmosphere corresponding to the sensed pressure. The SDP is a theoretical level at which the pressure of the atmosphere is 29.92 “Hg and the weight of air is 14.7 psi. 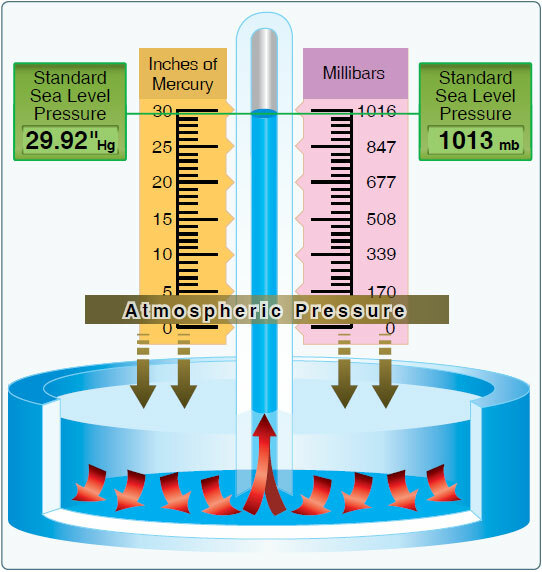 As atmospheric pressure changes, the SDP may be below, at, or above sea level. 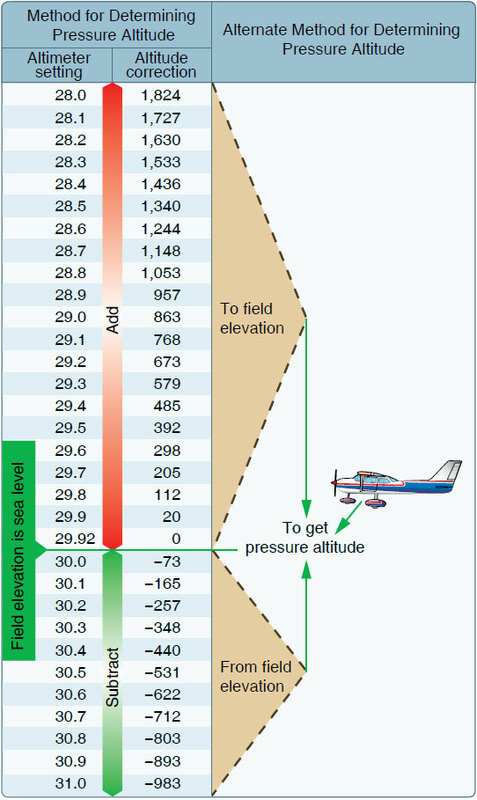 Pressure altitude is important as a basis for determining aircraft performance, as well as for assigning flight levels to aircraft operating at above 18,000 feet.